The portrait of the mother of Picasso is written in a manner completely uncharacteristic of him. A bright representative of Cubism in painting, he painted a portrait of his mother gently, barely perceptibly, lacking in his traditional style. The picture is filled with love. The whole image of a woman just breathes warmth. It becomes clear – this is not just a woman on the canvas, it is for the artist – the highest value, the greatest love. The portrait imbued with tenderness leaves only the warmest feelings in the soul. The portrait shows a woman to the waist. Her face is depicted in profile. Picasso features are captured in her appearance. The woman is plump, she is quite a few years old, but she looks beautiful. Her eyes are focused – most likely, her hands are occupied with some kind of homework. There is no smile on her face, but this does not spoil the image: she does her job with love. Woman’s hair is dark, curly. Hair gathered up on the back of his head – so as not to interfere with the business. It is clear that a woman is quite beautiful – there is not a drop of paint on her face, but she wants to look at her forever. Straight nose, dark eyebrows and eyelashes – eyes down, but it seems that she has dark bright eyes. There are beautiful earrings in a woman’s ears – they sparkle brightly in the picture, perhaps diamonds are in her ears. On the lady light airy dress in white. In the rays of light it casts pink. The whole image of a woman is written gently and neatly. Not a single stroke in the picture is made deliberately or roughly – each line is an addition, without which the image would not have taken shape. There is nothing superfluous – everything is selected and folded perfectly. It seems that a woman is breathing. 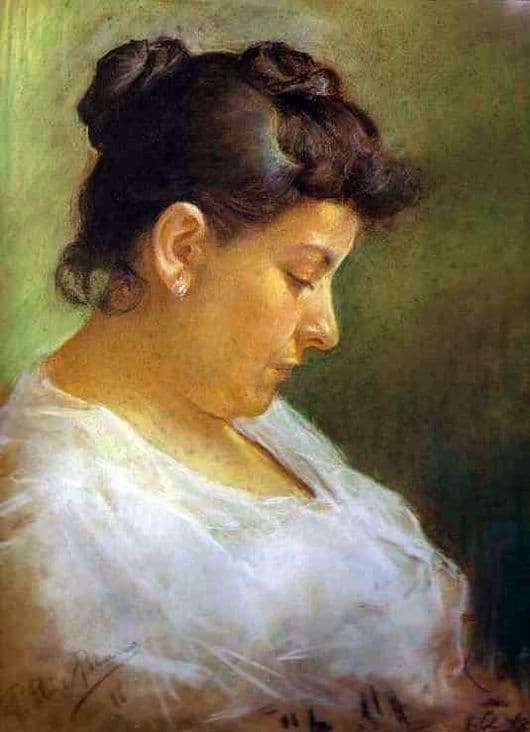 Without blinking, look at the portrait – it will seem to you that the lady’s chest rises up and falls, letting air out of her lungs: the portrait of Pablo Picasso’s mother is so realistic and warm.